Among the four episcopal appointments in this morning's Vatican News Service announcement was the welcomed news of Monsignor Robert C. Evans as Auxiliary Bishop of Providence. Pastor of St. Philip Church in Greenville, Bishop-Elect Evans is a North American College classmate of Bishop Thomas Tobin, Ordinary of the Diocese of Providence. Born September 2, 1947, in Moultrie, Georgia, Msgr. Evans attended public elementary schools in Providence, Our Lady of Providence High School and College Seminary, North American College in Rome, and was ordained a priest for the Providence Diocese in 1973 in St. Peter's basilica by Bishop James Hickey (later Cardinal Archbishop of Washington DC). Bishop-elect Evans holds a Bachelor of Sacred Theology degree from the Pontifical Gregorian University, Rome; Master of Theology degree from the Pontifical University of St. Thomas Aquinas, Rome, and a Licentiate in Canon Law from the Gregorian University. 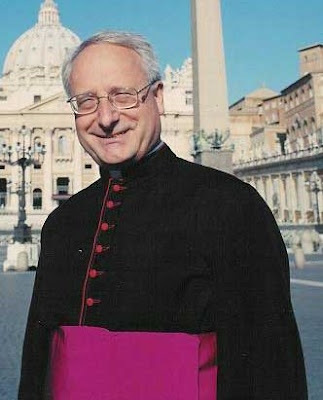 After ordination he held several assistant pastor positions in the Providence Diocese and was secretary to the bishop and Vice Chancellor, 1983-1987; Vice Chancellor and Tribunal Judge, 1989-1991; Chancellor and Director of the Office for Priests’ Personnel, 1991-2001; Director, Institute for Continuing Theological Education, North American College, Rome, 2001-2005; Secretary, Apostolic Nunciature, Washington, 2005-2007; and Pastor, St. Philip Church, Greenville, Rhode Island, 2007-2009. Like all auxiliary bishops in the Catholic Church, Bishop-elect Evans is provided a "titular diocese," or a diocese that once existed, but was suppressed by the Holy See. Bishop-elect Evans has been assigned Aquae Regiae, present-day Tunisia, as his titular diocese. He will join Bishop Tobin, retired Archbishop Pearce, SM; Retired Bishops Boland, OP; Roque; Gelineau, and Mulvey all residing in Providence. Also worth noting is Bishop-Elect Evans will be one of seven living native sons of the Diocese of Providence to be name Successor to the Apostles: McManus (Worcester), Matano (Burlington), Boland (ret), Roque (ret), Riley (ret), Angel (ret). A Mass of Episcopal Ordination is tentatively scheduled for Jan. 5, 2010, at 2 p.m. in the Cathedral of SS. Peter and Paul.